Ask anyone and they will likely tell you that the room their family spends the most time in together is the kitchen. Parties tend to gather there, friends tend to hang out there, and even a quiet coffee with a newspaper will at least begin and end in the kitchen. With all that traffic, your kitchen counters can quickly become a clutter zone. You may wonder how to keep clutter off your counters. The bathroom is another high traffic area, albeit for entirely different reasons, where clutter can consume the countertops and get in the way of using the space effectively. If you want to regain control of your counters and avoid clutter creeping back, read on and remind everyone in your house of one true fact: countertops aren’t storage areas. Pull everything out in the kitchen and sort! Find a day where your kitchen is at its most cluttered and take inventory. Just stand back and look at your counters as if you were a person thinking of buying the house. Would it look like you had enough counter space or would it look like the kitchen store exploded all over it? What’s on the kitchen counters that should be because you use it every day? The biggest clutter culprits? Small appliances. Look at all the appliances you currently have out on your kitchen counter. Do you use them all the time or are they a ‘once in a while’ tool? For many people, the coffee machine or tea kettle are essentials, used multiple times in a day, but the bread maker can probably be housed elsewhere. Decide what’s most important for your family’s everyday needs and put a priority on keeping those appliances at the ready. 1. The dish drying rack by the side of the sink. Do you actually use it to dry dishes or do things get tossed in there—like random container lids—never to be properly put away? If the latter, get rid of it for a while and see if everyone can find homes for the things they kept tossing in there! 2. The knife block. A lot of people like to keep their very sharp knives out of the drawer and in a block, which is understandable except that these blocks tend to take a lot of space and there’s a fair to middling chance that you use the three same knives for just about everything. Right? A great solution is to get a magnetic strip and find a bit of wall near your chopping board to hang it. You can put your three favourites there and buy sheaths for anything else and store them in a drawer. 3. Soap bottles and dispensers. This is important but you can also keep dish soap under the sink and leave only a dispenser for hand washing out, if you want to keep the clutter down. 4. Vertical paper towel holder. It’s time to switch to a wall or under cupboard mounted rack if you want to get that out of your way. 5. Fruit bowl. Yes, you want the kids to eat more fruit and it’s true that ‘out of sight is out of mind’, however you might do better by placing that bowl on the breakfast nook or dining table, so that it’s still around but not in your way. 6. A catch all basket. In an attempt to leverage the fact that the kitchen does tend to be the family meeting space, a lot of people put their command centre in the kitchen, and for lack of options, might use the kitchen counter to house a catch all box or basket for miscellaneous forms, papers or whatnot. Banish the whatnot by creating a proper command center for all your family’s goings on and papers. Looked upon as private spaces, we can get messy with our bathroom counters, can’t we? Makeup brushes, hair styling implements, gel, perfume, razors and shaving cream. All and sundry that we use most everyday ends up, for a lack of other options, on the counter. Inevitably, something gets knocked off at some point, and if you’re really gifted, it will get knocked directly into the toilet! Unlike the kitchen, even the daily essentials need a home that isn’t the counter. Why? Because bathrooms are often MUCH smaller spaces, with comparably less counter space than the kitchen. Some easy ways to keep things handy in the bathroom? 1. Use hooks to hang things like a basket for hair ties, or a wire basket for hot appliances like curling irons. 2. Add floating shelves or shelves with baskets: one for each member of the family, to store their essentials. They just pull it out when they’re in there and put it back when they’re done. 3. If you don’t have shelving or a cupboard under your sink, consider it! It’s the perfect place to put all of those things that you use semi-regularly but don’t need on the counter all the time, like hair spray or nail clippers, for example. 4. Have a home for makeup, hair brushes and other daily use items. If you HAVE to have them on the counter, try and keep them organized in a box or basket, so they’re not taking over! If you have a small kitchen or bathroom, all of this is doubly important! Clutter only makes a small space seem even smaller than it actually is. But even with a good sized space, keeping counters relatively clear means finding new ways to store items so they are accessible and handy without being in the way. Look for empty wall space where you can hang baskets, hooks or small shelves. The inside cupboard or pantry doors. Underneath the sink or under cupboards or cabinets. On top of cupboards, to store little used items that you still want to keep, like the turkey platter you only use twice a year! Group things together with trays! This keeps everything you need to put on the counter tidy, and therefore at least give the appearance of less clutter. Example? The salt, pepper, sugar and anything else you want right by the stove? Put it all on a little tray. The visual effect is awesome! Create counter shelving! A box turned on its side on the kitchen counter or a plastic shelf riser in the bathroom are great ways to organize those counter must-haves and leverage empty vertical space! However you get creative getting rid of counter clutter, you’ll be happy when you can see the space being used what it was intended for! You might also like this post about refrigerator organization. 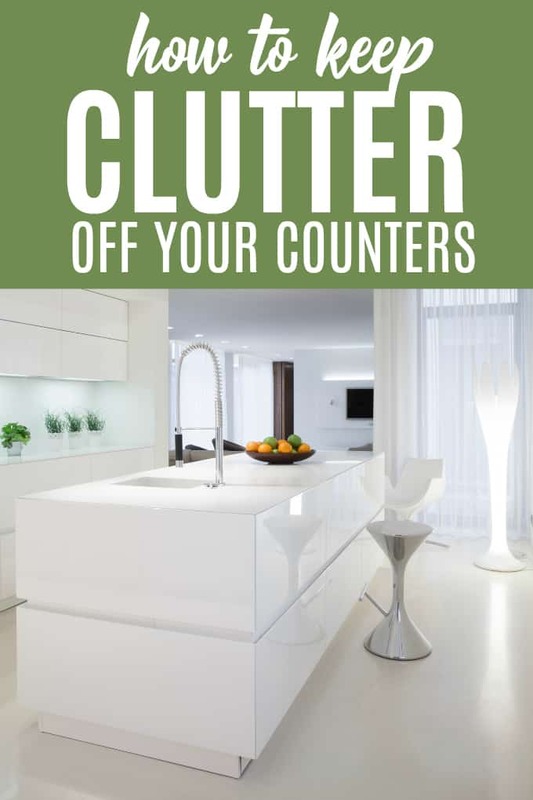 Do you have any decluttering tips for kitchen or bathroom counters? Over the years we’ve gathered and collected so many things and to be honest so much is just junk but my husband is a serious hoarder so it’s hard to get things organized even when I try. Awesome tips! I have definitely been staring at my mixer that’s taking up way too much space on my kitchen counter even though I haven’t used it in months. TIme to find it a new home! I do think you need to come and help me Stacie, you always have such good ideas and in my small apartment it seems the counter-tops are always cluttered – though my big mixer has disappeared into the pantry as I don’t use it often enough to warrant it standing on the counter top. I have cupboards but by no means enough.